Anyone working in software, from website, to mobile apps, to games, knows a few simple truths. Among the many truths that are consistent, these two are always important to remember. The first is that we always underestimate development time, typically by 2-3x. The second is that we love to re-invent the wheel. We re-invent the wheel because we don’t want to rely on a system that we haven’t developed, that we don’t completely understand. We believe that any system not developed in-house means that it may not be robust enough to accommodate the use-cases of our project, or that it might not be designed well enough for us to easily use. Instead of using a solution that was developed outside of the team, we become convinced that our team should develop our own solution, spending the extra man-hours, man-weeks to get a solution out there that we think will be easier to use, more complete to our problem, then what is already out there because this solution was developed by us and the solutions already out there were developed by other people for different purposes. In-general, it’s a phenomenon that exists when distinguishing ideas between in-groups and out-groups, or groups that you are a part of vs groups that you aren’t a part of. As a result, we tend to side with groups that are closer to our in-group. On a more singular scale, this can be tested on an individual basis. In an experiment on the NYT, a group of readers were asked to think of global issues, formulate a solution and evaluate their solution as well as the solutions of others. With little surprise, they tended to favor their own solutions more so then the solutions of others. The main reasons why we would expect this to be the case is because we either 1) Think our own solutions are better, 2) are a better fit for what we think is wrong the situation, 3) have an invested pride because we came up with the solution. As a follow-up to the experiment, they gave a similar problem but the people could only answer using a list of 50 words on a sheet. Because the words were predetermined, most people came up with a predetermined solution. But how do you think they rated their solutions relative to others solutions, then? That means that the Not-Invented-Here Bias isn’t just about a difference in solutions developed by in-groups vs out-groups, but even if the ideas generated are the same between your in-group and an out-group we prefer in-group ideas and are averse to (or against) out-group ideas. Furthermore, it shows that if you invest even a small amount of energy into an idea, it means that you’ll like it more. Not-Invented-Here Bias comes up a lot in gaming, but sometimes can be rightfully ignored. When coming up to a problem of getting from point A to point B, we tend to try the first solution that we come up with the most before moving onto other possible solutions. The Phase-Locket solution actually had a lot more risk involved, forcing me to worry amount about my magic count, knowing when I needed to reactive my phase-locket before its effects ran out, etc… In some aspects it was the more troublesome solution to come up with, but because it was the first solution that I came up with (since I was abusing the Phaze-Locket to get passed many obstacles earlier in the game on my first play through of Shovel Knight) I was committed to finding every nail that my hammer of a Phase-Locket could be utilized to solve. 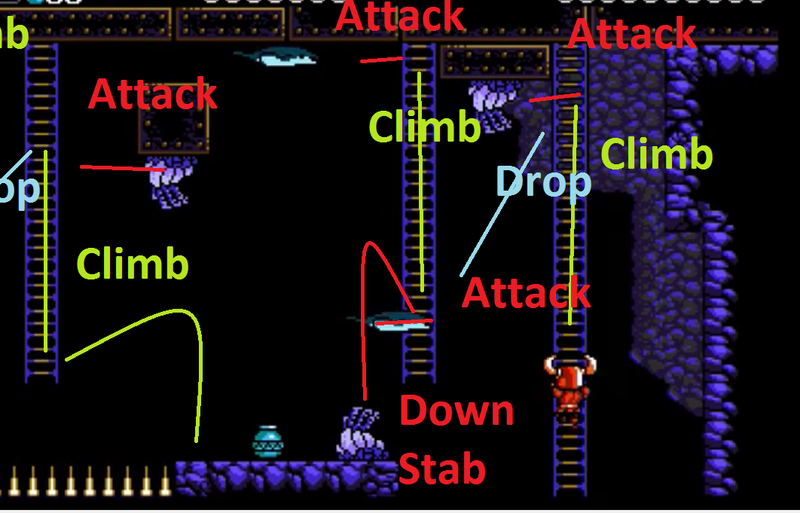 Sidenote: Actually, Shovel Knight’s flexibility in player’s solutions to its stages is one of its many strengths a is a great topic of discussion which I go into a bit here. 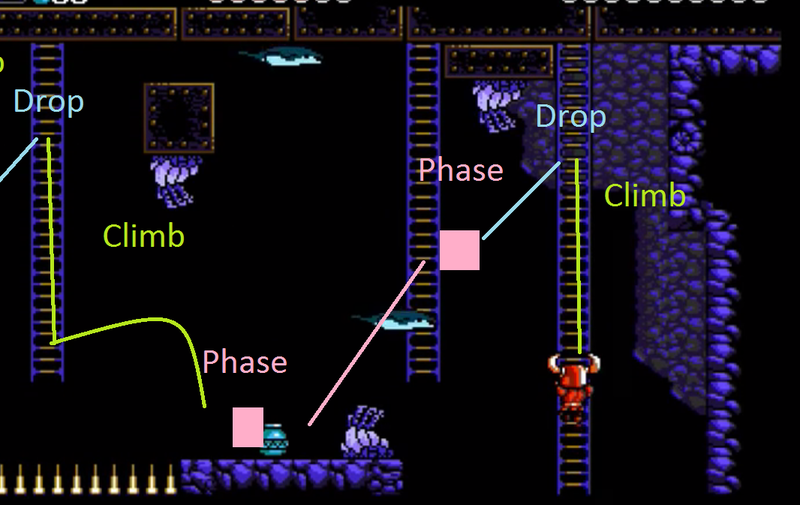 Most well-designed Single-Player games allow for a similar player flexibility in solving the problems of the stage and it becomes a topic of discussion of what is the best way to solving the stage. Obviously there are a lot of wrong ways to solving the many solutions of a single-player game, but in many single-player games, there are a lot of right ways to solving the stage, as well. When comparing our solutions with others, it’s hard to find the empirically best way to solving the problem of the stage unless we compare the ways high level players get through a game, like the ways that speed-runners solve the problem. Sometimes there’s an exploit that causes an enemy to make a known repeated pattern that is easy to defend against (aka creating a setup), or sometimes there’s a way to stun-lock an enemy shifting the difficulty of the fight to a “don’t screw up your button input-timing and you’ll win”-kind of fight. But if we aren’t comparing the speed-runners choice to solving a stage problem, then it becomes event harder to evaluate our solutions compared to others because we will always make our solution subjective to the situation in which we “solved” our stage. If we don’t have holy-water, then this is the best way to defeat Dracula. If we are didn’t pick up the Phase-Locket, then this was how I beat Plague-Knight. It’s only when haven’t come up with a valid working-solution is when we endorse another’s solution as better than ours. Focusing on Single Player experiences in gaming is one thing, but Not-Invented-Here (NIH) bias is best explored in the multiplayer settings as strategies go through the churn of a groups collective mind before being enacted. Similar to the Single Player games, there are games have many wrong ways to solving the problems of the stage, but the better games have many right ways to solving the same problems. These games don’t tie down the player to follow one script to win a fight and allows players to exercise there instincts and creativity when approaching a problem with their skill-set to find a working solution. A great example is a series like Monster Hunter. The game revolves around you and a group of friends studying the movements and attack patterns of a monster, discovering the opportune moments to start swinging, shooting, and smashing the bits of the monster and to know how not to get in each others way. For most of the fights in Monster Hunter, you only need to worry about your own self and worrying about interfering with other’s attacks and movements is secondary. This means that solving the problem of how to defeat a monster in Monster Hunter gets whittled down to making sure you know how not to get hit by the monster and when to start swinging. No worrying about team synergy, making sure that you can keep buffs on your team throughout the fight or keeping the enemy debuffed throughout the fight. No forcing specific roles of who-heals-who or we have too many melee people on the team. No stage mechanics that force someone to watch for a beacon to press so that the whole team doesn’t die. Each person just focuses on doing their share of damage and focusing on not getting hit by the monster and you should be able to win the fight (damage requirements aside). This means that NIH-bias is generally reduced to the invention of your own solutions to your own specific problems, rather than solutions that the whole team needs to adhere to. We convince ourselves about our faults and how to fix them and disregard the advice of others. But as long as the team progresses, reducing their damage taken and able to take down the monster, that advice can go largely unheard. Progress was made, whether you were working on fixing your actual faults or not. That’s not to say that this will produce the most optimal solutions to fighting monsters in Monster Hunter as team synergy, item rotations, combos, etc… will definitely create easier fights for you, but it isn’t a requirement to solving how to fight the monsters in Monster Hunter. World-Of-Warcraft, Final Fantasy XIV and other MMOs are a whole different beast for managing group dynamics. The difficulty in MMOs comes from the mechanics of its end-game content, either in their 4/5-man dungeons where most fights consist of a few mechanics with moderately-punishing results when your group fails to account for them; or from their large-group raids (8/16/24/32-person) where each of the various people from these groups are required to be given tasks that need to be tended to, and rules that everyone needs to know, e.g. if they are targeted by the boss that people either need to run to them, or run away from them, or knowing what order to kill enemies and how to keep them apart so that the whole group doesn’t get obliterated in a move. There are a lot of stages of difficulty when it comes to learning and performing to the mechanics that these fights require. The first is that a group needs to discover the rules to the fight, leading to a race to become world-first (e.g. The first group in the world to beating a boss). The second difficulty is that other groups needs to mimic these discovered rules and learn to tweak them based on the various group compositions that can be created so that there is a more general solution to defeating the boss. The third difficulty is finding the proficiency of each player with their class, because the more proficient each member is the easier time you’ll have with dealing with the mechanics of the fight and this has to be relearned sometimes as mechanics of the fight might prohibit the proficiency of certain classes over others.. The third difficulty is much akin to Monster Hunter’s dealings where it is a solution for the self and not for the group, so NIH-bias doesn’t affect the group that much, as long as you aren’t dying because you can’t meet the damage requirements for a section of the fight (aka dps-check, dealing a certain amount of accumulative damage during a period of the fight to stop a fight-ending from occurring) or a healing requirement for the fight (aka heal-check, healing members of the party enough before the next attack which would normally kill people not at near-full health). Because of this similarity to Monster Hunter, I’ll focus on the other two difficulties instead as it applies to the Not-Invented-Here bias. Becoming World-First in beating a Raid-Boss is a highly revered within the MMO community for many reasons. Being dedicated to the point of being one of the first in the world to reaching the Raid-Boss, as it requires going through the games story and reaching the maximum level of the game, as well as being one of the first in the first in the world to learning all of the dungeons and fights to getting to that Raid-Boss without outside material to learning the fights of those dungeons as you’re beating the content before people can create guides of that content to look up. Having a group dedicated enough to spend their time on a 20-30 minute long fight, of which you throw a night’s worth of work to make progress towards a new phase of the fight to only absorb another 2-3 minutes of new content only to take that new information and trying to figure out what happened. Re-enacting all of the pieces that happened to the group, who got a debuff put on them during this portion, why were people getting killed in one hit during this other portion, and so on. This dedication within your group and the race against other groups to finding out how to beat a Raid-Boss amalgamating in the potential first defeat of such a boss, all from trial-and-error, deductive reasoning, observation and pulling every trick possible from your inventory. Damage buffs to pass dps-checks, shields to ignore some fight-mechanics, edging out just a bit more damage or health for a single-attack because your healers are mid-cast but you’re about to take a hit that can’t be ignored. The race to getting World-First is easily a stressful ordeal and in working to World-First there are many solutions proposed for each portion of the fight and not just from your group, but from the various groups trying for World-First as well. With only so many times that your group can try per night, you can only try one or two of those proposed solutions at a time, and like we’ve learned from the NIH-bias we’ll tend to choose solutions that we’ve proposed or solutions that we’re involved with. Conflict can start to fester within the group and spread when people’s ideas aren’t given a try until a proper solution is found. “But my solution could’ve worked, we just didn’t try it yet,” will always be lingering within the group if a workable-solution was found before trying their solution. Being the second-wave of players to come up to a Raid-Boss means that you have a few guides of the various mechanics to look out for during a Raid-fight, but need to practice to recognizing those mechanics and knowing what each person needs to do in order to not die and move onto the next phase of the fight. The difficulty in working with a group in the second-wave is that because there’s a few guides already out, it becomes very hard to deviate from the guide that we “decided to follow originally.” We are biased to the first guide that we follow and only start to look at other guides when our group hits a wall in progress countless times, a byproduct of NIH-bias and primary-result of the Sunk-Cost Fallacy (The faulty rationale that because we’ve invested some time into an approach that we must continue with it to make our previous work not in vain). We’ve already invested some energy into following this guide and it has worked so far, so we should keep trying to follow this guide to solve the problem. Learning a new guide from the ground up means we’re setting our progress back. What we forget is that there’s a difference between a guide of mechanics and a guide of execution, and while the mechanics guide tells us what the wrong ways of doing things are (triggering instant death, triggering punishing damage for improper execution), the guide of execution tells us one correct way of doing things and we become inflexible in that the guide of execution becomes the goto guide for solving the problem rather than using the guide of mechanics as the rules and the group coming up with a solution around those mechanics. In general for MMOs and other Cooperative Games, there are many wrong ways to solving a problem in the game, but once a solution is found it becomes the general standard within the community with little room of people to deviate from that solution. Don’t get me wrong. The Not Invented Here Bias isn’t always a bad thing to have, even if it can cause some distress and distractions between you and your friends, your guildies, and your colleagues. Like any bias, it has goods and bads with underlying psychological benefits as the reason for its existence. Being generally accepting of ideas within your circle means that social relationships continue on general good terms instead of taking the side of people outside of your circle. And taking pride and investment in your own ideas means you can become more motivated, putting more effort into your projects. We just need to be weary of when to keep pushing for a chance at our own ideas and when to concede that maybe another’s approach is worth a chance. Your friendships and your time will appreciate it, in the end. And even if it doesn’t work, a fresh perspective might give your group a clue in how to solve the problems that you’re running to.